Besides collecting nectar from flowers, bees select only those pollens that contain the greatest amounts of protein and other nutrients. 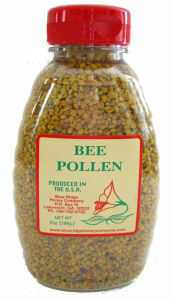 BEE POLLEN is a storehouse of protein, vitamins and minerals. It is used to combat the symptoms of illnesses and allergies by many customers. BEE POLLEN also provides energy. It is recommended to start with small amounts and gradually work up to 1 - 2 tsp daily. Add to cereal, blender drinks, or simply eat it and enjoy the nutty, sweet/sour, taste.